One big difference between Carmageddon II and the original: there are several big events around town this weekend that were scheduled before the 405 closure was on the docket. I know there will be the temptation to drive to the events. But we also remind you that all the following events are accessible via Metro buses, trains or other shuttles. The Metro Rail and busway map is above. And here’s a map of the entire Metro system. Single rides are $1.50 and day passes $5. In order to board Metro trains, you will need to purchase a Metro TAP card at a ticket machine — it costs $1 — and then load either single fares ($1.50), day pass ($5) or a variety of cash amounts on the card. The cards are reloadable and last for three years. Don Giovanni at the Los Angeles Opera at Dorothy Chandler Pavilion, Friday 7:30 p.m. and Sunday 2 p.m. The Red and Purple Line subway Civic Center station is one block from the Dorothy Chandler Pavilion — and a nice stroll through the new Grand Park. Plus you get points for taking the subway to the opera. Herbalife Triathlon Los Angeles, Sunday morning, Santa Monica to downtown Los Angeles. The Expo Line’s Culver City Station is adjacent to the Venice Boulevard section of the bike route. The running race part of the course in downtown Los Angeles is easy to reach via the Red/Purple Line subway, the Expo Line and Blue Line. Shuttles will depart every 15 minutes and will pickup or drop off at all MTA stops along Santa Monica Blvd between Plummer Park and San Vicente. Please be aware of the continuous construction and closures on various Los Angeles freeways and the surrounding areas during this time and allow extra commuting time. Thank you. Plummer Park can be reached from the 4 or 704 buses that run along Santa Monica Boule vard between downtown L.A. and Santa Monica. The 4/704 also stops at the Red Line subway’s Vermont/Santa Monica station. Here’s the timetable for the 4 and for the 704. Los Angeles Dodgers versus Rockies, Friday 7:10 p.m., Saturday 6:10 p.m. and Sunday 1:10 p.m. The Dodger Stadium Express shuttle runs between Union Station and the stadium and is free to those holding tickets to the game. All the details are here. Union Station is easy to reach via Metrolink, the Red/Purple Line subway, the Gold Line and Silver Line. The Go-Gos (Saturday night) and Wilco (Sunday night), Hollywood Bowl. The Bowl offers park-and-ride shuttles from locations across Los Angeles County, including Westwood, Santa Monica, Westchester and Culver City on the Westside. Here’s info on the shuttles and departure times for the Go-Gos and here’s the info for the Wilco show. The Red Line station at Hollywood/Highland is about a .9-mile wlk to the Bowl. The Hollywood Bowl shuttle also serves the Hollywood/Highland Station and the Universal City station. A heavy rail line down the 405 coridor. 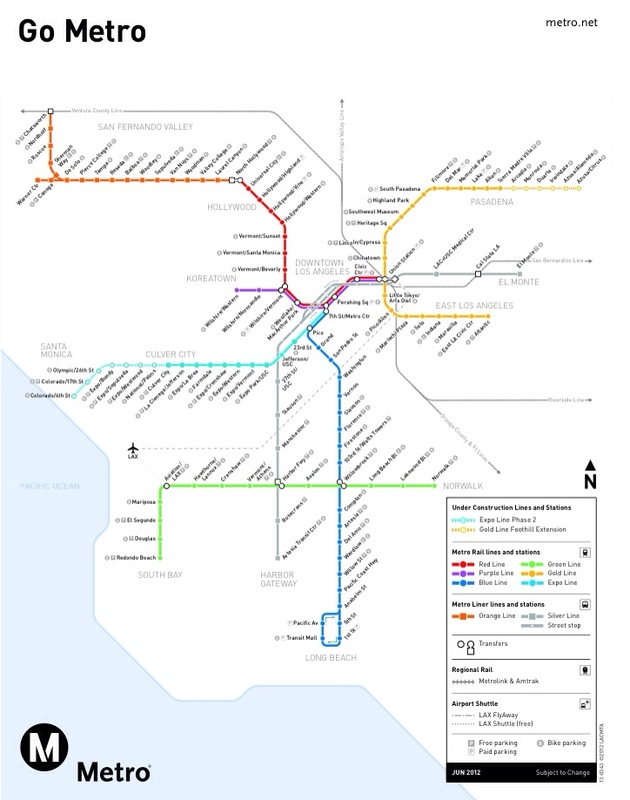 It would connect the MetroLink, Orange, Expo, Green (and Crenshaw), and Blue Lines. That would take pressure off the 405 and enhance the whole network. The widening of the 405 was ill conceived.